Do you love meeting new people? Do you smile easily, make friends quickly, and have outstanding people skills? Are you adept at customer service? Do you like to try the newest restaurants and travel whenever possible? If so, you may be a perfect candidate for Buffalo State College’s Hospitality Administration Program. Hospitality and tourism is an enormous industry. It’s divided into five major service segments: food, lodging, recreation, travel, and convention/meeting. According to the U.S. Bureau of Labor Statistics, the travel and tourism sector has an annual economic impact of around $6.5 trillion in U.S. dollars worldwide. The U.S. hotel industry has a total retail value of $493.76 billion per year and employs millions of people. Clearly, hospitality is a rapidly expanding industry with plenty of opportunities. It’s no wonder why hospitality administration is one of the most popular majors among undergraduate students. Buffalo State’s hospitality administration program prepares graduates for management positions in various aspects of the hospitality industry. The department’s mission is to educate and develop proven hospitality professionals by integrating a strong core curriculum with a deliberate emphasis on experiential learning. The department is defined by its extraordinary focus on student development and is firmly grounded in producing graduates that excel in communication, teamwork, professionalism, and problem-solving. Largest in SUNY: Ours is the largest accredited four-year hospitality program in the State University of New York (SUNY) system. 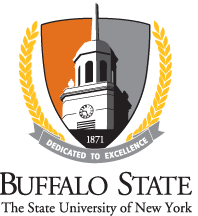 Special accreditation: The Buffalo State program is accredited by the Accreditation Commission for Programs in Hospitality Administration (ACPHA). Fewer than 20 percent of all four-year hospitality programs are ACPHA-accredited. Diverse options: Students can choose between three concentrations — restaurant and institutional management, hotel tourism management, and culinary arts. Stellar faculty: Many of our faculty members have professional experiences in management and leadership in restaurants, private clubs, hotels, and tourism organizations. Professional certification: Students can receive professional certification through the American Culinary Federation, the American Hotel and Lodging Educational Institute, the National Restaurant Association Educational Foundation, and Training for Intervention Procedures (TIPS). Departmental advisory board: Students benefit from a department advisory board consisting of professional chefs, restaurant owners, casino owners, country club and hotel managers. Real-life experience: Students can work in two real-world environments as part of their coursework: Campus House, an on-campus dining club, and Hotel Henry, a boutique hotel with accompanying restaurant located across the street from campus. Numerous scholarships: The department is supported by the Statler Foundation, which provides a number of scholarships to our majors. Local hospitality leaders, as well as the department itself, also provide annual awards. And the New York Restaurant Association, The New York State Hospitality and Tourism Association, and the New York State Club Managers Association of America have scholarships available. Campus House: Established in 2001, Campus House is a state-of-the-art training facility that is also a restaurant open for lunch, happy hour, and special events for faculty, staff, and alumni. Hospitality students earn academic credit as they create original menus, work in an open kitchen, and manage marketing and event promotions. Hotel Henry Urban Resort and Conference Center: Opened to the public May 2017 in the iconic Richardson Olmsted Complex, Hotel Henry provides real-world experience for Buffalo State hospitality and tourism upperclassmen. They work with guests in the 88-bed hotel and handle food service in the adjoining restaurant, 100 Acres: The Kitchens at Hotel Henry. Club Managers Association of America: The Buffalo State chapter of CMAA provides educational and professional development, networking, fellowship and contacts with nearby club managers, and participation in various social and civic activities. National Society of Minorities in Hospitality (NSMH): This national organization is the premier professional organization for hospitality students. It addresses diversity and multiculturalism, as well as the career development of our student members. Eta Sigma Delta (ESD): The international honor society for students in hospitality management recognizes hospitality and tourism students for outstanding academic achievement, meritorious service and demonstrated professionalism. The hospitality and tourism program has a focus on active learning. Majors learn at Campus House, through courses like catering management, event management, training, etc., as well as in the new partnership with Hotel Henry. The department sponsors an annual study abroad experience every spring recess and many of those participants complete research related to cultural tourism.